■We examine two popular dividend strategies, high-dividend-yielding and dividend growth equities, exploring their similarities and differences and considering implications for their use in the context of portfolio construction relative to both high-quality fixed income and equities. 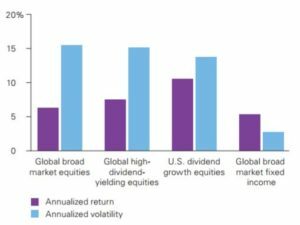 ■ Our analysis finds that absent beneficial tax treatments, dividend-oriented equity strategies are best viewed from a total-return perspective, taking into account returns stemming from both income and capital appreciation. ■ Substituting dividend-oriented equities for fixed income significantly raises a portfolio’s risk profile and diminishes its downside protection. Dividend-oriented equities also tend to have greater interest rate sensitivity than other equities, making their performance more susceptible to changes in bond yields. ■ Compared with other equities, the performance of these strategies has been time-period dependent and largely explained by their exposure to a handful of equity factors: value and lower volatility for high-dividend-yielding equities and lower volatility and quality for dividend growth equities. We explored high-dividend-yielding equities and dividend growth equities, two popular forms of dividend investing that have been gaining increasing attention given low interest rates and a record of strong historical performance. Our research indicates that, absent beneficial tax treatments, dividend-oriented equity strategies are best viewed from a total-return perspective, taking into consideration returns stemming from both income and capital appreciation. Substituting dividend-oriented equities also significantly raises a portfolio’s risk profile when used in place of fixed income and diminishes its downside protection. Dividend-oriented equities also tend to have greater interest rate sensitivity (that is, duration) than other equities, making their performance more susceptible to changes in bond yields. The strong historical risk-adjusted performance of dividend-oriented strategies has been time-period dependent, with much of their outperformance realized during the technology stock bear market of 1999–2000. The performance of dividend-oriented strategies has also been highly dependent on a handful of equity factors. Emphasizing these strategies therefore reflects, in effect, a conviction that these factors will continue to outperform.